Dessert is so much sweeter when you have to earn it by eating all your broccoli. If your favorite song is playing, finish it before getting out of the car. Damn the consequences, getting wet is fun. A good book is worth reading. 20 times. You can never have too many Starbucks napkins in your glove compartment. Having water on hand at all times is good. Knowing where the closest bathroom is at all times is better. A good 15 minute conversation at the end of the night is well worth the equivalent loss of sleep. ‘Tis better to give… but opening gifts is a hell of a lot of fun! To make an omelet, you need to break a few eggs… get chopped ham all over the counter, shredded cheese in the cooking grates and make a royal mess of the kitchen. Superheroes are very necessary. They assure us that good will triumph over evil, whether it has 8 telescopic arms, a posse of mad penguins, or weapons of mass destruction (or not). “The Force” is real. You just have to try harder. Fear is irrational. If that giant bird beak at the aquarium freaks you out, no one’s going to reason you out of it. Leave no fallen toy behind. You can tape a show; daylight, not so easy. You won’t die if you eat something off the floor. You evidently can die from eating cauliflower. Flames make anything cooler, especially bicycle helmets. Be vigilant. You never know when a projectile, fist or forehead (donning aforementioned helmet) will come flying at your crotch. The most excruciating 15 minutes that a parent and child must endure: waiting for the movie to start while being subjected to the same 4 Hollywood trivia questions over and over again. 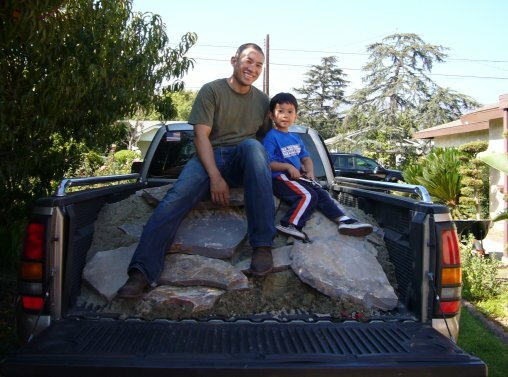 You can have hours of fun in your own backyard playing with toy trucks in a mound of dirt… right next to the beautiful sandbox that dad spent an entire day building, which included hand shoveling playsand, one wheelbarrow-load at a time from his truck. And by the way, he still has residual sand in his truck bed, which has probably been used as a litter box for the past year by neighborhood strays. It's ok son, cat poop gives me 'burb cred.